©2016 Arc Angel Industries, Inc. ARC ANGEL® is a registered trademark of Arc Angel Industries, Inc.
Below is a compilation of United States statutes pertaining to conducted electrical weapons (CEWs) or stun guns. This compilation is not all inclusive and is merely a summary of some of the relevant statutes. 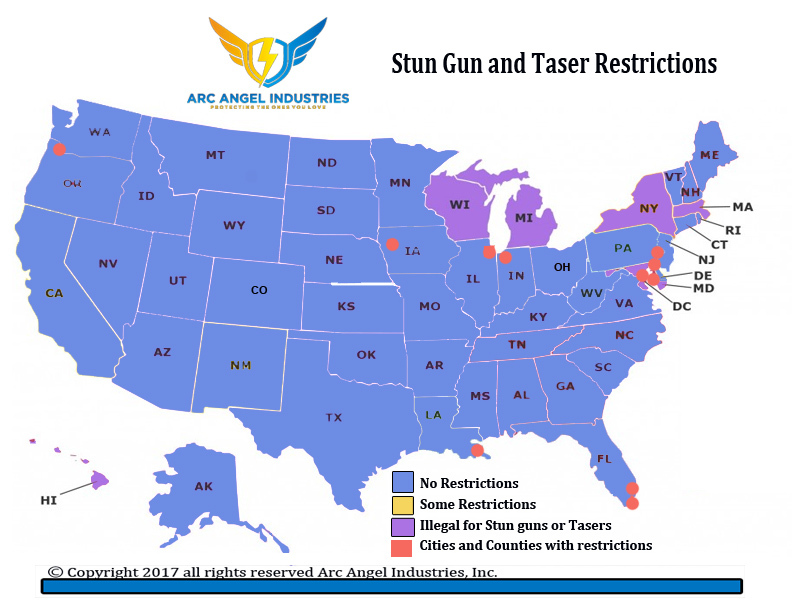 Because state and local laws may change, it is your responsibility to research your applicable state and local laws prior to selling, transferring, possessing, transporting or using an Arc Angel brand stun device. Alabama Legal without major restrictions. Under Alabama law, a stun gun is not considered a firearm. Rather, Alabama defines a firearm as a weapon that uses gunpowder to discharge a shot. While stun guns do not fall within the definition of a firearm, the use of a stun gun may still result in criminal liability. Alaska Legal without major restrictions. Alaska criminal law directly addresses the use of stun guns, which, when used during the commission of a crime, can result in being charged with a felony that carries a possible prison sentence. Arizona Legal without major restrictions. The use of an authorized remote stun gun or remote stun gun during the commission of a crime is among the 24 aggravating factors identified by statute that may authorize the judge to impose the maximum prison term allowed by law for defendants convicted of felonies. Arkansas Legal without major restrictions. A person who uses a stun gun to commit certain felonies is subject to an additional prison term of one to ten years if the crime is committed in front of a child. California Legal without major restrictions. In California, most people may purchase, posses, or use a stun gun, and they do not have to obtain a permit. However, you may not purchase, possess, or use a stun gun if you are a convicted felon, someone convicted of an assault under federal or any state’s laws or the laws of any country, or have a prior conviction for misusing a stun gun under Cal. Pen. Code §244.5, or addicted to any narcotic drug. Colorado Legal without major restrictions. It is a class 5 felony to use a stun gun in the commission of a crime. Penalties include a fine up to $100,000. Connecticut Illegal to carry a stun gun in public (openly or concealed) without a permit. It is a felony to possess a stun gun in public without a license. Penalties include a fine of up to $500, up to three years in prison, or both. The stun gun will also be forfeited. Delaware Legal without major restrictions (some cities have banned possession). It is a Class A misdemeanor to carry a concealed stun gun for an unlawful purpose. Penalties include a fine of up to $2,300, up to one year in jail, or both. D.C. Illegal to possess, carry, transfer, loan, manufacture, or sell a stun gun It is a misdemeanor to possess, carry, or sell a stun gun. Penalties include a fine of up to $2,500, up to one year in jail, or both. Florida Legal without major restrictions. It is illegal to carry a stun gun for purposes other than self-defense (with greater penalties for concealed carry than for open carry). Georgia Legal without major restrictions. It is a felony for a convicted felon to possess or own a projectile stun gun; penalties include one year (and up to five years) in prison. Hawaii Illegal to possess, sell, or carry a stun gun It is a misdemeanor to purchase, possess, or use a stun gun in Hawaii. Penalties include a fine of up to $2,000, up to one year in jail, or both. Idaho Legal without major restrictions. It is a misdemeanor for convicted felons to possess or use a stun gun. Penalties include a fine of up to $1,000, up to six months in jail, or both. Illinois Legal, but must obtain a Firearm Owner’s Identification card. Unlawfully carrying a stun gun is a class A misdemeanor. Penalties include a fine of up to $2,500, up to one year in jail, or both. Indiana Legal, but most obtain a handgun license. It is a Class B misdemeanor to sell or furnish a stun gun to a person who is less than eighteen years of age. Penalties include a fine of up to $1,000, up to 180 days in jail, or both. Iowa Legal without major restrictions. It is illegal to carry a concealed stun gun without a concealed weapons permit unless you are located on your own property. Kansas Legal without major restrictions. Generally, Kansas does not prohibit the possession of stun guns in public areas like courts and school grounds. Louisiana Legal without major restrictions. It is a misdemeanor to possess a concealed stun gun if it is intended to be used as a dangerous weapon. Penalties include a fine of up to $500, up to 6 months in jail, or both. Maine Legal without major restrictions. It is a Class D crime (misdemeanor) to use an electronic weapon upon any other person for reasons other than self-defense. Penalties include a fine of up to $2,000, up to 364 days in county jail, or both. Maryland Legal without major restrictions. It is illegal to carry a concealed stun gun for purposes other than self-defense. It is also illegal to carry a stun gun (openly or concealed) with the intent to unlawfully injure another individual. Massachusetts Illegal to purchase, possess, or sell. It is a misdemeanor to purchase, possess, sell, or use a stun gun in Massachusetts. Penalties include a fine of $500 to $1,000, between six and 30 months in jail, or both. Michigan Legal, but a concealed pistol permit is required. It is a felony to sell or possess a stun gun. Penalties include a fine of up to $2,000, up to four years in prison, or both. Minnesota Legal without major restrictions. It is a felony to use a stun gun in the commission of a crime. Penalties include a fine of up to $10,000, up to five years in prison, or both. Mississippi Legal, but must obtain a concealed carry license to carry outside of your residence. It is a misdemeanor to carry a concealed stun gun for use as a deadly weapon. Penalties include a fine of up to $500, up to six months in jail, or both. Missouri Legal without major restrictions. It is a Class D felony to carry a concealed stun gun if it is intended to be used as an offensive, lethal weapon. Penalties include a fine of up to $5,000, up to four years in prison, or both. Montana Legal without major restrictions. It is a misdemeanor to carry a concealed stun gun if it is intended to be used as an offensive, deadly weapon. Penalties include a fine of up to $500, up to six months in jail, or both. Nebraska Legal without major restrictions. It is a Class I misdemeanor to carry a concealed stun gun if it is intended to be used as a deadly weapon. Penalties include a fine of up to $1,000, up to one year in jail, or both. Nevada Legal without major restrictions. It is a Category B felony to use a stun gun on another person for purposes other than self-defense. Penalties include a fine of up to $5,000, one year (and up to six years) in prison, or both. New Hampshire Legal without major restrictions. It is a Class B felony to possess a stun gun outside of your residence if you are a convicted felon. Penalties include a fine of up to $4,000, one year (and up to seven years) in prison, or both. New Mexico Legal without major restrictions. It is a petty misdemeanor to possess a concealed stun gun if it is intended to be used as a deadly weapon. Penalties include a fine of up to $500, up to six months in jail, or both. New York Illegal to purchase, possess, or sell. It is a Class A misdemeanor to possess an electronic dart gun or electronic stun gun. Penalties include a fine of up to $1,000, up to one year in jail, or both. North Carolina Legal without major restrictions. It is a Class 2 misdemeanor to carry a concealed stun gun in public. Penalties include a fine of up to $1,000, up to 30 days in jail, or both. North Dakota Legal but a concealed weapons license is required. It is a Class B misdemeanor to carry a concealed CEW at a public gathering. Ohio Legal without major restrictions. It is a first-degree misdemeanor to carry a concealed stun gun in public if the intent is to use the stun gun as a deadly weapon. Penalties include a fine of up to $1,000, up to six months in jail, or both. Oklahoma Legal without major restrictions It is a felony to possess a stun gun while committing or attempting to commit another felony. Penalties include two years (and up to 10 years) in prison. Subsequent violations carry increased penalties. Oregon Legal without major restrictions. It is a Class C felony to carry a stun gun with the intent to use the stun gun unlawfully against another person. Penalties include a fine of up to $125,000, up to five years in prison, or both. Pennsylvania Legal without major restrictions. It is a second degree felony to purchase, possess, or use a stun gun if you are a convicted felon. Penalties include a fine of at least $5,000 (and up to $25,000), up to ten years in prison, or both. Rhode Island Illegal to possess or use a stun gun. Penalties include the confiscation of the stun gun and a fine of up to $1,000, up to one year in jail, or both. South Carolina Legal without major restrictions. It is illegal to carry a concealed stun gun if the intended use involves committing a crime. Penalties include a fine of $200 (and up to $500) or 30 days (and up to 90 days) in jail. South Dakota Legal without major restrictions. Anyone who uses a stun gun to cause, or attempt to cause, bodily injury to another commits a Class 3 felony, punishable by a fine of up to $30,000, up to 15 years in prison, or both. Tennessee Legal without major restrictions. It is a Class E felony to carry a stun gun if it is intended to be used as a deadly weapon during the commission of a crime. Penalties include a fine of up to $3,000, one year (and up to six years) in prison, or both. Texas Legal without major restrictions. It is illegal to carry a stun gun in Texas for purposes other than self-defense. It is also a crime to attempt to take a stun gun (or other weapon) from a peace officer or other law enforcement agent. Utah Legal without major restrictions. It is a Class B misdemeanor to possess a concealed stun gun if it is intended to be used as a dangerous weapon. Penalties include a fine of up to $1,000, up to six months in jail, or both. Vermont Legal without major restrictions. Anyone who carries a stun gun with the intent to injure another person commits a crime, punishable by a fine of up to $200, up to two years in prison, or both. Virginia Legal without major restrictions. It is a Class 6 felony for convicted felons and people who were convicted of certain crimes as minors to carry or use a stun gun in public. Penalties include either a fine of up to $2,500, up to one year in jail, or both. Washington Legal without major restrictions. Anyone who, by an act of criminal negligence, causes bodily harm to another person through the use of an electronic shock device or projectile stun gun commits a Class C felony, punishable by a fine of up to $10,000, up to five years in prison, or both. West Virginia Legal without major restrictions. It is a misdemeanor to possess a concealed stun gun if it is intended to be used as a deadly weapon. Penalties include a fine of $100 (and up to $1,000), up to 12 months in jail, or both. Wisconsin Legal, but a concealed weapons permit is required. It is a Class H felony to carry, sell, transport, manufacture, or possesses a stun gun. Penalties include a fine of up to $10,000, up to six years in prison, or both. Wyoming Legal without major restrictions. It is a felony to possess, manufacture, transport, repair, or sell a stun gun with the intent to threaten another, commit assault, or inflict bodily injury on another. Penalties include a fine of up to $1,000, up to five years in prison, or both.